A virtual people's parliament and an archive to store freedom of information requests are two ideas competing for the chance to be built on the web. The competition is being held by MySociety.org, a charitable project that helps construct civic and community websites. The first contest in 2003 resulted in the launch of WriteToThem.com, that allows people to contact politicians. Anyone can submit a proposal and the winner will be announced in summer. WriteToThem.com has been a big success and has helped take politics to a wider audience. Statistics gathered by the site show that 44% of people who use it contact their MP or local councillor have never written to them before. So far MySociety.org has built four other websites all of which are free to use. Initially they were built by volunteers in their spare time. A £250,000 grant from the Office of the Deputy Prime Minister in 2004 has allowed the charitable project to continue. Another site built after the 2003 competition, Pledgebank.com, is allowing people to take direct action to improve their community. 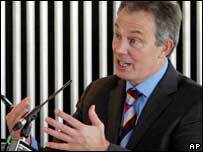 The site was given a huge boost yesterday when Tony Blair logged on and signed up to the venture. The site allows people to make a pledge to do something for their community providing a minimum number of people agree to follow their example. Ideas currently looking for supporters include a pledge to fill a public advertising space with something thought provoking if 350 people will pay £10. The Prime Minister, Tony Blair, said that he would become the patron of a London community sports club and work for it in the run up to the London Olympics if 100 other public figures were prepared to do the same. So far, Culture Secretary, Tessa Jowell and the Mayor of London, Ken Livingstone have supported the pledge. The new competition is hoping to inspire the same level of creativity. In addition the team hope to give people something really useful. "We try to give people services that at are really tangible," says Tom Steinberg, director of MySociety.org. "We don't just want to provide information." The only rules for the competition are that the sites must be founded on electronic networks, including the web or mobile phones and fax; have a real world impact on democratic and community aspects of people's lives and have the same cost whether they are catering for 10 or 10 million users. People are encouraged to leave online feedback on the proposals but the final decision will be made in late June by the MySociety.org team. "Although we are a democratic site, we can't make this completely democratic on the grounds that if the public voted for something that we couldn't possibly afford to build we'd have to let them down." Mr Steinberg told the BBC News website. "We've got to be able to make the final call." The winning website should offer something very different to traditional council or government websites according to Dr Jo Twist, Senior Research Fellow at the Institute for Public Policy Research (IPPR). "If I have an issue about the lack of recycling in my local community, I can feel more effective by taking direct action through a MySociety site," she says. "It would take too long to take the same action by going to my local council website. They are just not well designed and don't use web tools effectively." The collaborative aspects of many of the sites and the use of software such as wikis normally used on community websites increase the accessibility and appeal of the sites. "This is what politics and political engagement are about in a digital age," says Dr Twist. "Direct, collaborative action, and direct response." The deadline for the submission of proposals for the site is the 1st June 2006.